CAMBRIDGE, UK, February 19, 2016 (ENS) – The appearance of a large and growing crack in the ice shelf near the British Antarctic Survey’s Halley VI research station has prompted officials to close the base for the first time. Operational since 2012, Halley VI is made up of a series of eight interlinked pods built on skis that can be towed across the ice by specialist heavy vehicles. 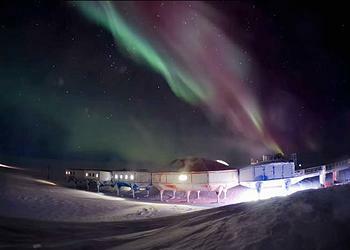 The world’s first re-locatable research facility, Halley VI is an internationally important platform for global earth, atmospheric and space weather observation in a climate sensitive zone. There, scientists in state-of-the-art labs study pressing global problems from climate change and sea-level rise to space weather and the ozone hole, which was first discovered at Halley in 1985. 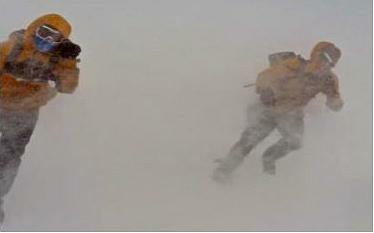 Normally, around 70 people live and work at the base during the summer and fewer than 20 during the winter. This is the first winter that the base has been completely closed since it delivered its first scientific information in 2012. The research station consists of five linked modules on hydraulic legs fitted with skis, enabling the units to be towed into new positions. Being able to move the station is vital because of its site on the Brunt Ice Shelf, which is constantly moving towards the Weddell Sea, where chunks of ice calve off the floating shelf as icebergs. Named Halloween Crack, the latest fissure was lengthening inland as fast as 600 meters a day in November and December, which are summer months in Antarctica. The crack is now growing at about 200 meters a day. Halley VI was designed to be relocated if the ice becomes dangerous. It had already been moved 23 kilometers (14.2 miles) inland during Antarctica’s summer of 2016 because another ice chasm had begun to grow. 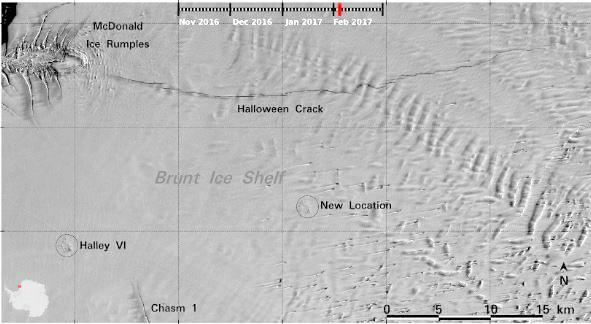 The Halley VI base was only 17 kilometers (10.5 miles) from the Halloween Crack when it first appeared in October 2016. To predict calving events, the ice shelf movement is monitored via seven GPS sensors known as the Lifetime of Halley network. Information from the European Space Agency’s Copernicus Sentinel-1 and Sentinel-2 satellites also helped British Antarctic Survey officials to decide on the closure. Enveo, a company that uses satellite data for cryosphere studies, and the Survey used radar images from Sentinel-1 and optical images from Sentinel-2 to monitor the situation. Recent Sentinels sequences have revealed a complex picture that made it difficult to predict how the Halloween Crack would evolve, so as a precaution the British Antarctic Survey decided to evacuate and shut the base for the coming winter. “This also provides us with essential information for ice-deformation models, leading to a deeper understanding of such events,” he said. January and February are peak summer months in Antarctica, with daytime temperatures on the Peninsula reaching above 50°F while the continent receives nearly 24 hours of daylight. “Though without direct effect on Antarctic infrastructure, similarly dramatic summer development of ice-shelf fractures is revealed around Antarctica, notably Pine Island glacier in West Antarctica and the Larsen-C ice shelf in the Weddell Sea region,” said Drinkwater. Meanwhile, scientists report that this year the extent of summer sea ice in the Antarctic is the lowest in 38 years of satellite recordkeeping. The Antarctic sea ice minimum marks the day, typically towards end of February, when sea ice reaches its smallest extent at the end of the summer melt season, before expanding again as the winter sets in. This year, sea ice extent contracted to 2.28 million square kilometers (883,015 sq miles) on February 13, according to data from the U.S. National Snow and Ice Data Center. The previous low was recorded in February 1997. 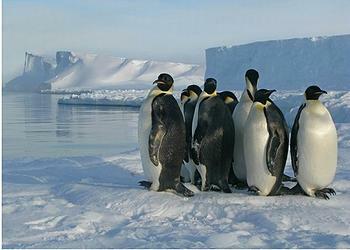 Antarctica will soon be experiencing the winter months that reach their deepest darkness in July. There is 24-hour darkness for 105 days when scientists normally working at Halley VI would be completely isolated from the outside world by the surrounding sea ice and impossible flying conditions. This year, no one will be at the research station. The original base at Halley was founded in January 1956 by an expedition of the British Royal Society as part of International Geophysical Year 1957–58. The bay where the expedition decided to set up their base was named Halley after the astronomer and Fellow of the Royal Society, Edmond Halley. Halley VI Research Station was commissioned in 2006 and its innovative structure was the result of an international design competition launched by the Royal Institute of British Architects and the Survey in 2004. Construction began in December 2007 and the station took four years to build, delivering its first scientific data in 2012.